Gardening is great (cheap) therapy for me. I love to dig in the dirt and be surrounded by nature. You don't have to think, you can just "be." It was only after I discovered daylilies that the vegetable garden vanished and everything took a left turn. The madness started many years ago. 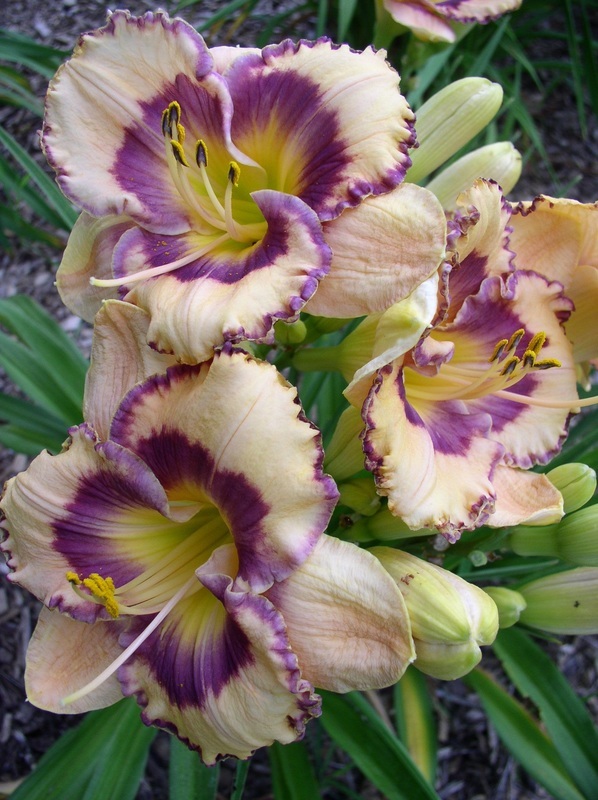 With all the new daylily hybridizations that are introduced each year, it's a constant struggle for me to keep purchasing in check. Many of my plants have very special meaning to me, some were gifts; some were trades, many started as proliferations or divisions of plants I had admired. 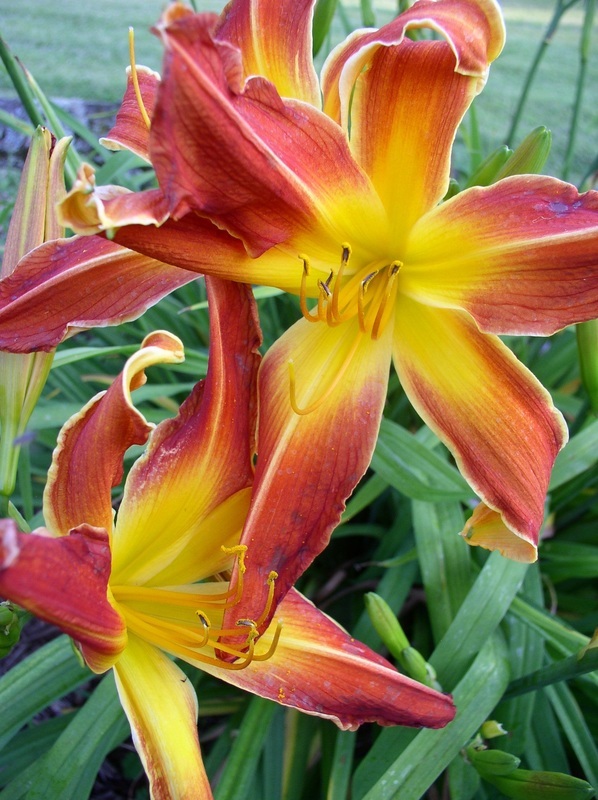 Each daylily has a story. I'm reminded of friends who inspired me, guided me, and of the fun times we spent together in each other's gardens or on day trips when the plants were purchased. I live in western Wisconsin (Zone 4), on a two-acre parcel of land out in the country with my husband Ange . We are surrounded on all four sides by weeds. It's a relentless battle, but we choose not to use chemicals of any kind; we have simply adjusted our attitudes. Lots of critters roam around - deer, coyotes, fox, opossums, raccoons, pine squirrels, skunks, and fox. Black bear sightings have been made close by, but thankfully not by me. 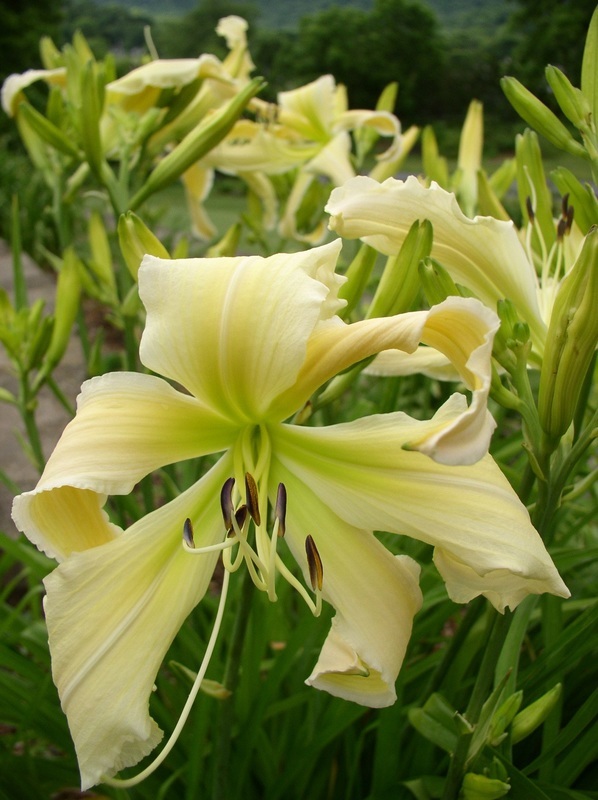 I belong to both the Wisconsin Daylily Society and the American Hemerocallis Society so I can keep up with what's new. Pictured above: daylily "Pumpkin Festival"
This boulder inspired my website name. In my other life I do graphic design, which comes in handy sometimes. 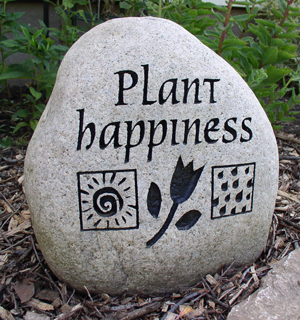 I always wanted a garden rock. I couldn't find what I wanted, so I decided to design my own. This rock was chosen from a pile of hundreds at a local landscape business. A patient man sorted through countless rocks with his Bobcat until picky-me found the perfect size and color to fit my design. I know it looks small in this photo, but it weighs at least 200 pounds! After it was loaded in our SUV, Ange and I took our rock and my Adobe Illustrator file directly to have it engraved at a memorial place. The day we picked our rock up we were exceptionally lucky to be able to talk with the man who did the engraving. He showed us step-by-step how the engraving process was done with a sticky vinyl mask of the design and described the sandblasting process. Afterwards, the rock got a water bath. Awesome job! Once home, we backed the car up to the flower bed we wanted the rock to be in and rolled it down a large wood plank. Where the rock landed is where it has permanently resided! 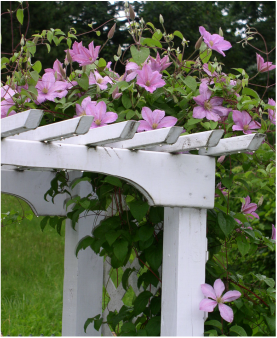 Pictured above: Clematis "Comtesse du Bouchaud"
Although daylilies are my obsession, here are some other plants that I grow.